An audio visual report is exactly what it sounds like. We shop your competitor hotels, checking for their rates on specific pieces of equipment and services, and report back to you on a detailed excel spreadsheet. Pricing and any available written menus will be provided. Smaller hotels generally use outside vendors. If that is the case, we will attempt to get the information directly from them and pass that along. You may provide your own criteria. Our AV specialists make a call to the AV department of the hotel and ask some basic questions based on a possible group event. We inquire about pricing on a few items and usually ask if they can just send us a menu so that we aren’t wasting their time not knowing exactly what we “might” need. In doing this, we save hours of phone calls to check on each item individually and we can get you more information than you originally asked for. If we run in to any issues, we will report those back to you in the comments section. Each item that you have asked for pricing on is found on the price list and recorded on the spreadsheet for your convenience. 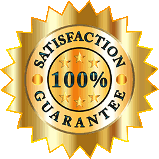 If a specific item isn’t available, we will not a comparable item and let you know the difference in the comments section if applicable. Many hotels will offer package pricing for commonly used items and services. In those cases, we will note the package name, pricing, and break down exactly what is included in that package. 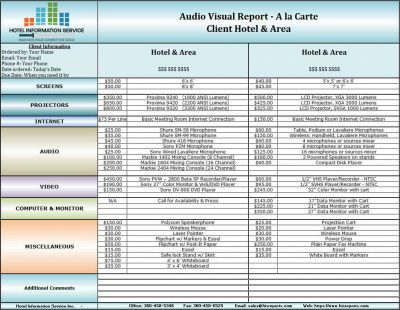 We always include any AV menus with our reports at no additional cost to you. Turnaround for these shops is usually two to three weeks, however, if we have the information prior to that, we will send it to you right away. Pricing is for up to five of your competitors.